A friend complained that I have written Tagore was the greatest poet India has produced, he was unhappy as he thinks this title belongs to Iqbal. Well actually I never wrote this in the first place, what I had written is that Tagore is acknowledged as the greatest poet India (and here I meant Indian Sub-Continent) has produced in the last 200 years. Well there is little doubt about this, is there? Tagore was the first non-White to win a Nobel prize, his poems form the national anthem of two countries and if there is a poll across the Sub-Continent asking the question who is the greater poet among them I have no doubt Tagore will win. So the fact remains that Tagore is acknowledged as the greatest poet India has produced in the last 200 years, but is he the greatest poet India has produced in the last 200 years? This is an entirely different question as here we are asking a personal opinion and everyone will have their own opinion, some I am sure will think that neither of them deserve this title. We will therefore leave this for now though at some stage it would be interesting to compare their works and ideas. As such there is a lot of overlap between their philosophy and poetry. Both seem to be heavily influenced by Rumi and Shirazi and though Iqbal at times writes in terms of Islamic specific poetry Tagore remained by an large a pantheistic/mystic poet throughout his life. I was curious if they ever met each other or exchanged letters for they both lived in the same country at the same time, Tagore was 16 years older than Iqbal but outlived him by 3 years. To my astonishment I found out that the two never ever met, not only that, they never exchanged any letters and curiously Iqbal never even acknowledged Tagore in any way! As for Tagore the story is slightly different. Tagore admired Iqbal and this is apparent from the message he sent to Inter-collegiate Muslim Brotherhood of Lahore which celebrated Iqbal Day in January 1937, in this message he openly acknowledged Iqbal’s greatness and the universal quality of his poetry. I have been unable to find the dates but it has been recorded that once when Tagore was in Lahore he went to see Iqbal at his Mayo Road residence. Iqbal at that time had gone to Bhawalpur so no meeting took place. When Iqbal came back he was informed of Tagore’s visit and his desire to meet him, he never tried to contact Tagore, never wrote to him or anything, how strange! Why?! No one knows for sure though many have often wondered why. A few years ago one of Pakistan’s leading Iqbal scholar M Ikram Chughtai who was Director of the Urdu Science Board published a research based article on this subject. Mr Chughtai claims that the reason Iqbal gave a cold shoulder to Tagore was envy, or perhaps even jealousy. Chughtai calls it ‘The Award Complex’ and claims that the reason was Iqbal’s resentment on Tagore being awarded the Nobel Prize for literature in 1912 and the fact that Iqbal was never considered for this prize (another anti-Muslim conspiracy perhaps). Chughtai says “Tagore’s award had been hovering on Iqbal’s mind throughout his life and he, directly or indirectly, could not free himself from this ‘award complex’. Soon another development was to take place which was to further sadden Iqbal: King Raza Shah Pahlavi of Iran extended an invitation to Tagore to visit his country. He went there in 1932. As a royal guest, he was given tremendous welcome in many cities of Iran. While in Tehran, he received a similar invitation from the King of Iraq. 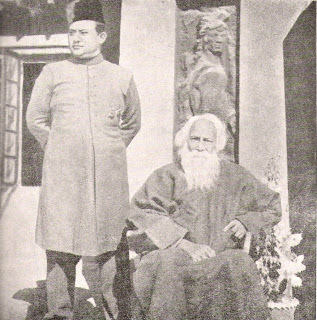 In Baghdad, Tagore was received by King Faisal himself. 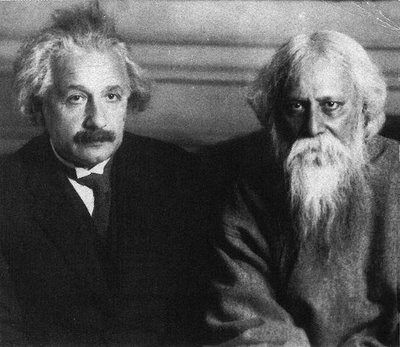 Tagore had also been invited by Einstein to his Berlin home in January 1930. I found it interesting and a bit ironic that the Millie Gazette claims to be the leading newspaper of Indian Muslims while as I mentioned above Chughtai sahib is from Pakistan and one would expect things to be the other way around! Also as far as I can tell Shirazi’s influence on Iqbal’s poetry is well known and has been acknowledged by Javed Iqbal. So there we are, these two great men, philosophers and poets, the best that India produced in the last 200 years never met and never put their heads together to produce any work and mankind is all the poorer for this. So while I am not saying who is the greater poet among the two but one thing can be said, if (and please before anyone gets upset please note the IF), if what Mr Chughtai has claimed is true, then there can be little doubt who was the greater man. This entry was posted on July 24, 2014, in Thoughts on Rabindranath and tagged Iqbal, Tagore. In July 1930, two of the world’s greatest minds – Rabindranath Tagore and Albert Einstein – met for the first time at Einstein’s Berlin abode to have one of the most riveting conversations of all time, exploring the dichotomy between religion and science. In almost all arenas including cultural backgrounds and occupations, the two intellectual heavyweights were diametrically different. But their mutual love for music, inquisitiveness, and passion for the truth united them, and resulted in their stimulating philosophical discourse. Fortunately, Dimitri Marianoff and Amiya Chakravarty were present during their meetings, and recorded the conversations. Marianoff, the husband of Einstein’s stepdaughter, promptly published the story in August 1930. The conversation was transcribed courtesy of David Gosling’s Science and the Indian Tradition: When Einstein met Tagore, and the January 1931 issue of Modern Review. TAGORE: Not isolated. The inﬁnite personality of man comprehends the universe. There cannot be anything that cannot be subsumed by the human personality, and this proves that the truth of the universe is human truth. EINSTEIN: There are two different conceptions about the nature of the universe: The world as a unity dependent on humanity, and the world as a reality independent of the human factor. TAGORE: The world is a human world – the scientiﬁc view of it is also that of the scientiﬁc man. Therefore, the world apart from us does not exist; it is a relative world, depending for its reality upon our consciousness. There is some standard of reason and enjoyment which gives it truth, the standard of the eternal man whose experiences are made possible through our experiences. TAGORE: Yes, one eternal entity. We have to realize it through our emotions and activities. We realize the supreme man, who has no individual limitations, through our limitations. Science is concerned with that which is not conﬁned to individuals; it is the impersonal human world of truths. Religion realizes these truths and links them up with our deeper needs. Our individual consciousness of truth gains universal signiﬁcance. Religion applies values to truth, and we know truth as good through its own harmony with it. TAGORE: Truth, which is one with the universal being, must be essentially human; otherwise, whatever we individuals realize as true, never can be called truth. At least, the truth which is described as scientiﬁc and which only can be reached through the process of logic—in other words, by an organ of thought which is human. According to the Indian philosophy there is Brahman, the absolute truth, which cannot be conceived by the isolation of the individual mind or described by words, but can be realized only by merging the individual in its inﬁnity. But such a truth cannot belong to science. The nature of truth, which we are discussing, is an appearance; that is to say, what appears to be true to the human mind, and therefore is human, and may be called maya, or illusion. This entry was posted on June 5, 2014, in Thoughts on Rabindranath, Uncategorized, Websites relevant to Tagore's works and tagged Rabindranath Tagore and Einstein. The rulers of the ancient State of Tripura were not mere patrons of art and culture but also accomplished in different creative fields. Even the reputed journals of the West mentioned their works of art, photography, literature and music. 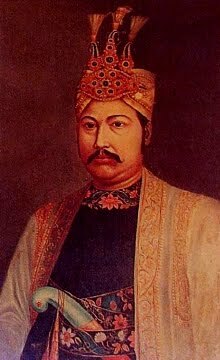 Tripura’s modern era began with Maharaja Birchandra (1862-96) who was a superb painter, an excellent photographer, a great composer of music, a profound scholar of Vaishnav literature and a connoisseur of all creative activities. He created a stir in the literary world by conferring the honour of the ‘best poet” in 1882 upon the young Rabindranath Tagore. The poet was hardly 21 years old then and he had to his credit only one book of verses – Bhagna Hriday – (The Broken Heart). 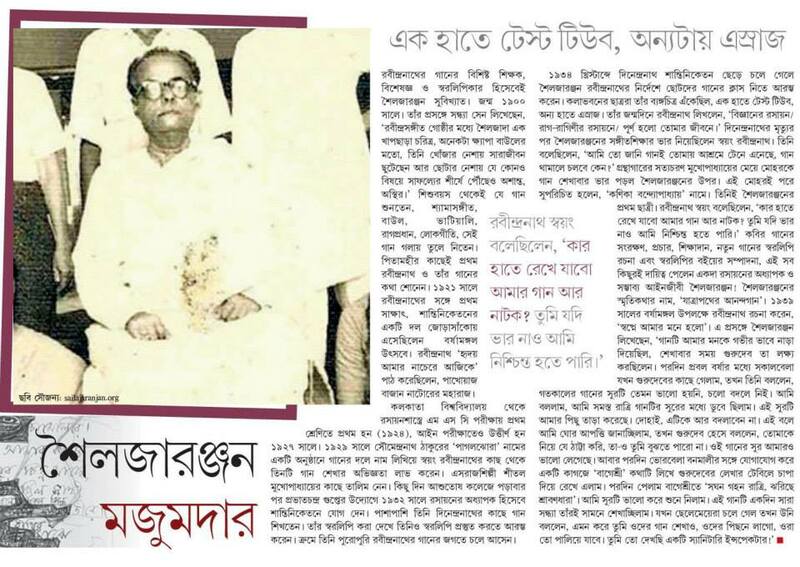 Birchandra was so moved that he immediately sent a minister all the way to Jorasanko to convey the message that he could see the promise of a great future in the young poet. Tagore was taken by surprise to say the least. Tagore mentioned the event in his autobiography Jiban Smriti and paid tribute to Birchandra on a number of occasions during his journeys to Tripura. This was the beginning of what were to be lasting ties between the grand ruling house of a princely state and a great poet who dominated the literary world. 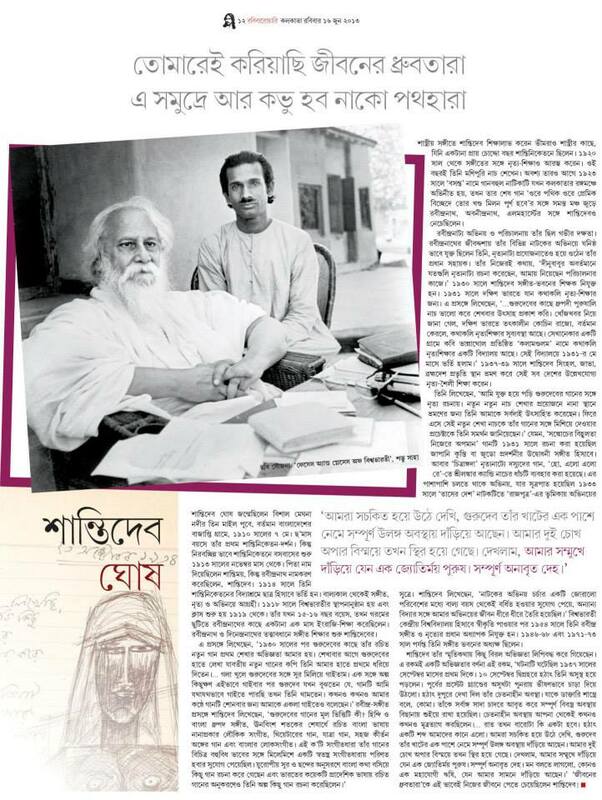 This historic bond lasted for over sixty years till the end of Tagore’s life. He became friend and guide to four generations of Tripura rulers. The elderly Birchandra was quick to befriend the young poet. Tagore went to Kurseong twice, during 1894 and 1896. On both the occasions the Raja invited Tagore to be a guest of honour. Those meetings provided a rare opportunity to both of them to know each other more intimately. 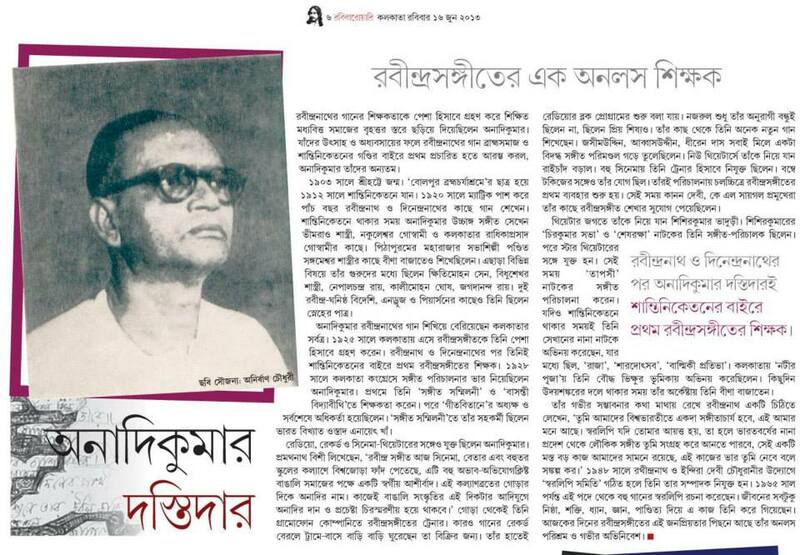 Tagore was then hardly thirty-three years old and Birchandra almost double his age. The young poet felt shy about expressing his thoughts but in all literary discussions he was treated as an equal. Tagore often recalled the sweet memories of those golden days that he spent together with Birchandra at Kurseong. Birchandra was pained at the ruthless criticism that Tagore’s early literary works drew from critics at the time. He even wanted to buy a printing press and invest one lakh rupees, a princely sum in those days, so that editions of Tagore’s works could be published. But as luck would have it, while returning from Kurseong Birchandra died in Calcutta in 1896. Birchandra’s worthy son, Radhakishore, lost no time in extending an invitation to Tagore. Radhakishore ascended the throne in 1897 and died in 1909. During these twelve years, Tagore visited Tripura five times. On many occasions, Radhakishore sought Tagore’s help in dealing with complicated problems of statecraft. Tagore’s advice was sought in all matters right from the appointment of ministers, drafting of state budget, framing of code of conduct for the officers of the royal court and general approach towards dealing with erring officials. Tagore showed hitherto unknown skills in all these areas of statecraft. The erstwhile Tripura royal family still preserves the rare historic documents written in Tagore’s own handwriting where he has shown his remarkable ingenuity in matters of public finance, state policy and principles of education. 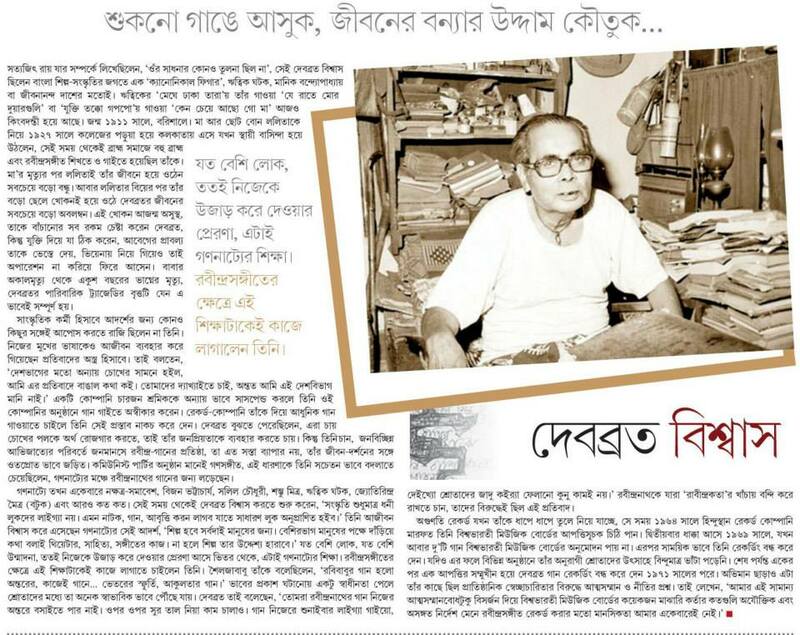 Radhakishore became dependent on Tagore in all the areas of day-to-day administration. This association of Tagore with Radhakishore had a lasting impact on Tripura’s ties with greater Bengal. The benevolent Maharaja contributed liberally in various literary, cultural and scientific endeavors of Bengal. 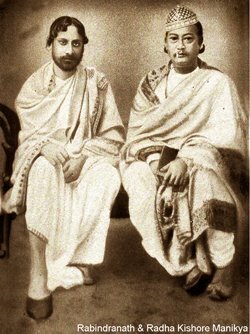 Tagore once approached Radhakishore for financial help for scientific research undertaken by Acharya Jagadish Chandra Bose who was in England and in a dire financial state at that time. Radhakishore himself was in a very precarious condition financially as the palace at Agartala was being re-built after being damaged by a severe earthquake. The marriage of prince Birendrakishore was also approaching. But the ever-generous Radhakishore did not fail to rise to the occasion. He wrote to Tagore that he was prepared to deprive his would-be daughter-in-law from a piece or two of jewellery for he was sure that in return, Jagadish Babu would decorate mother India in a much more befitting manner. He granted a sum of rupees fifty thousand, a vast amount of money in those days with the only stipulation that his name was not to be made public. Radhakishore also sanctioned an annual grant of Rs. one thousand for Tagore’s Viswa Bharati which was continued for nearly fifty years till the death of the last ruler, Maharaja Bir Bikram Kishore. Radhakishore’s son, Birendra Kishore, also inherited the rare artistic acumen of his grandfather, Birchandra. He was a great painter as well as a musician. Like his forefathers, he extended liberal financial grants to Viswa Bharati. It was during his time that Tripura’s relationship with Tagore acquired a cultural role. 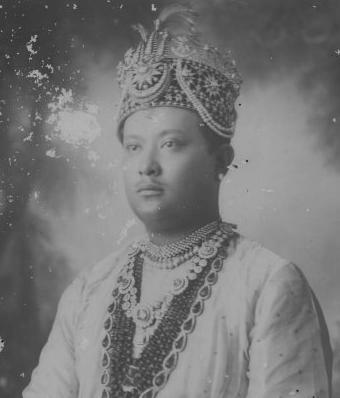 In 1939, Birchandra’s great-grandson – Maharaj Bir Bikram Kishore, visited Shantiniketan.He deputed Rajkumar Buddhimanta Singh from Tripura as a Manipuri dance teacher at Shantiniketan. Buddhimanta was followed by a number of other talented experts in Manipuri dance from Tripura. They made remarkable contributions in providing the floral foundation of effusive softness, style and grace to Rabindra Nritya. Following in the footsteps of his ancestors, Tripura’s last ruler, Maharaja Bir Bikram Kishore greatly respected Rabindranath Tagore. It was his privilege to confer on Tagore the honorific “Bharat Bhaskar” just three months before the death of the great poet. Tagore’s 80th birth anniversary was celebrated at the royal Durbar of Tripura. An emissary was sent to Shantiniketan to formally confer on Tagore this last tribute of Tripura. The ailing poet was so moved by this generous royal gesture that he made no secret of his feelings,”Such a free and disinterested bond of friendship between an immature poet whose fame was yet uncertain and one enjoying royal distinction is unprecedented in the history of any literature. The distinction that this royal family has conferred on me today illumines the final horizons of my life”. During his last visit to Agartala in 1926, while addressing a public meeting Tagore had another occasion to pay tribute to Tripura. In response to the love showered on him by the Kishore Sahitya Samaj of Agartala, Tagore said, “…it has been my privilege to receive honour even from the hand of kings in the West. But the tribute I received from a prince of my own country is to me, personally speaking, of much greater value. That is why my relationship with the State of Tripura is not just that of a guest for a day. This relationship is wedded to the memories of the father and the grandfather of the present king”. 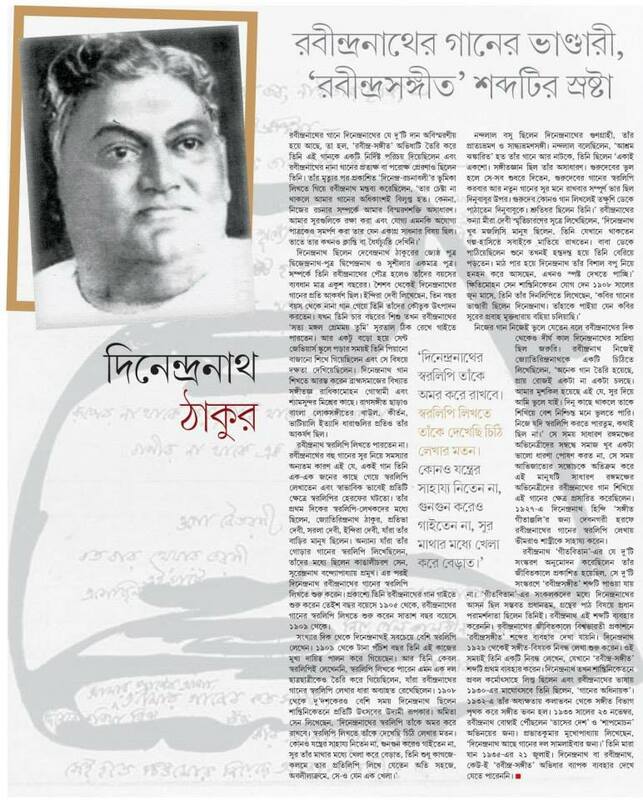 All articles are courtesy of Sourit Dey. These may be read by enlarging them by holding down the CTRL and + buttons at the same time. This entry was posted on July 14, 2013, in Newspaper articles, Thoughts on Rabindranath, Views on Rabindranath Tagore.